Light-hearted weekend read: Will we ever be on time in Vietnam? 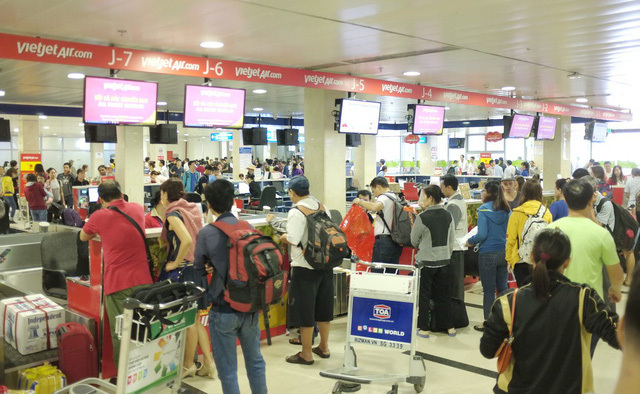 Passengers check in at Tan Son Nhat International Airport in Ho Chi Minh City in this file Tuoi Tre photo. In February, just as Tet hits the nation in the solar plexus, I’ll be on another visa run. And since I have the money I’m flying out of the country rather than sulking to the border. Will my plane leave on time? Unlikely. Will my online booking be accepted or screwed-up? Highly likely. Will the immigration line ever get shorter? Not in this century. Will they ever make a decently made and priced coffee at the terminal? If the staff were Italian, yes. All around the world, people complain about trains failing to leave on time. Heck…that even affected the German rail network in 2018! Yet, publicly we seem less prone to protesting over delayed or cancelled flights. Of all the airport networks I’ve used in Asia, Vietnam seems (to me at least) to have the worse, most chaotic and mismanaged terminals. Another reason why there’s so little ‘return tourism’ in this country. It’s become a fact of life when travelling by air into and around Vietnam that your flight is almost always late, cancelled, delayed or the latest…’scheduled’ or ‘en route’ which means nothing to me as I stand with a sprained neck staring at the status board. Sigh…back to the smoking room which is somewhere near the North Pole. For the past ten years, I’ve flown in and out of the country. I can nostalgically remember the ‘good old days’ when you only had to battle your way through the airport to get to the gate and stay there. These days it’s major chaos as hundreds of people run from gate 4 to gate 11 ten minutes from boarding time – which is closer to hell than the smoking room. And it’s downstairs with no escalator, you’re a family of four and no one remembers who’s got the boarding passes. Still, it’s not a bad way to assess your fitness level, jogging to the new gate destination, jumping on the bus to the plane parked somewhere near the Vietnamese border, tromping up whose wobbly, creaking metal stairs, playing rugby football with everyone trying to put a rectangular bag into a curved storage bay, then collapsing into your seat after walking over the people already seated. If you didn’t want to kill someone after that…you’re good to go. In the old days, I used to take a book and read contently with my feet on my luggage as children happily attempted to walk over my ankles. I deliberately tripped them and glared… It worked rather well. These days I’ve got the laptop and dozens of anime movies to watch as the world shuffles by. Headphones and lots of J-Pop and K-Pop to listen to when the shonky looking businessmen shout happily in the smoking room and plenty of yummy ham and cheese sandwiches to make my fellow passengers jealous as their Pringles fall on the floor. Now here’s the thing, a disastrously locally made sandwich I bought at the airport in Ho Chi Minh City a few eons ago nearly landed me in hospital. Since those days, I have stocked up on goodies at the Korean-run Family Mart in District 1 and the Subway outlet next door – never had a problem since! Nobody has ever questioned the bread at airport security – it’s ciggy lights and nail-clippers they are after. Good on them, not sure what I’d do if confronted by a terrorist with a nail-clipper. Burger King saves my life on many of these sojourns into the travel twilight zone. Probably also because they have the few decent chairs still available in an airport unless you’re business club and bunk down in the airport lounges. Also if you leave the French fries to the last, you can hog the two chairs and table for half an hour as desperate parents search for somewhere for the kids to sit and eat. In an airport, I’m a changed man; everyone for himself. And only ninety minutes late – what a bargain! It’s just a dream, to be on time… but I can dream, can’t I?